Israeli soldiers injured, Friday, many nonviolent protesters holding the weekly procession against the Annexation Wall and colonies, in Bil’in village, west of Ramallah, in central West Bank. 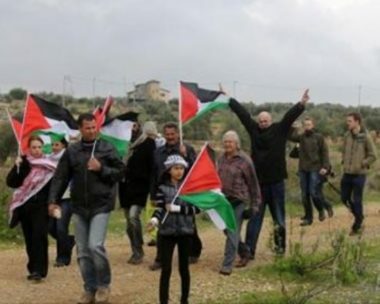 The Palestinians, accompanied by international peace activists, marched from the center of the village, and headed towards the illegal Annexation Wall, built on the villagers’ lands, separating them from their orchards, in Abu Lemon area. They chanted to the liberation of Palestine, and the removal of the illegal Wall and colonies, and also marked International Women’s Day, while calling for steadfastness and ongoing resistance until liberation and independence. They also called for the release of all detainees, and the internationally-guaranteed Right of Return of the refugees. The soldiers attacked the nonviolent protesters with a barrage of gas bombs and concussion grenades, causing dozens to suffer the effects of teargas inhalation. The protesters also condemned the killing of Amir Darraj and Yousef Anqawi, who were shot dead by Israeli soldiers while heading to work, when their car accidentally struck a parked military jeep, before the army took their corpses. 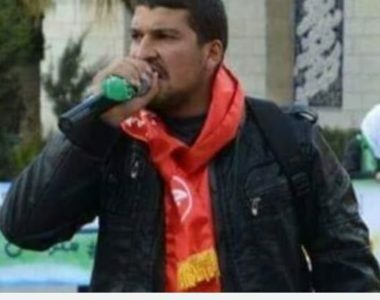 A third Palestinians, Haitham Al-Qam, who was with them in the car, was injured and abducted by the army. The Popular Committee against the Annexation Wall and Colonies in Bil’in, called on various local, regional and international human right groups to intervene, and hold Israel accountable for its crimes, and for prosecuting it at the International Criminal Court. The Committee also denounced Israel’s illegal policies of holding the corpses of slain Palestinians, as it constitutes an illegal act of collective punishment targeting entire families.